This is an old feature that I decided we needed to revive. Workbox tags are the way Little Learning Lovies first started out and it’s time to get LLL back to it’s roots by giving away free workbox tags today! I want to give you free workbox tags! Today and for a very limited time, I’m going to give EVERYONE a set of free Workbox Tags! At Little Learning Lovies, we have dozens and dozens of different workbox tags to choose from in three main styles. We have our standard sets which are just a few pages, our expanded sets which have more tags, and then our DELUXE sets which have 72 tags! 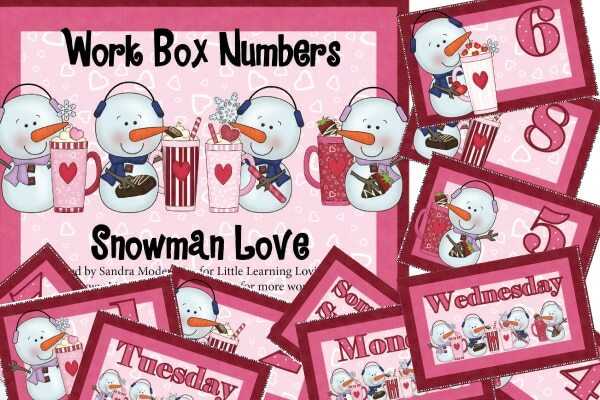 Guess what… This free Snowman Love Workbox Tag Set is a DELUXE SET!! And it doubles as calendar numbers! So.. What are Workbox Tags and why would I want them? If you haven’t experienced the pure joy of seamlessly sliding from one subject to another without having to search for books, paper, supplies, scissors, pencils etc, than you obviously haven’t explored the beauty of the workbox system. You can click here to learn more about it right from it’s creator. Or read this great blog post from Confessions of a Homeschooler! If you’d like MORE free workbox tags, please sign up for our newsletter by adding your email to the form at the top of the side bar! You’ll get more free goodies, like games, tags, and activities. We have a GIVEAWAY for you to enter! Did you enter yet? You could win a gift to the LLL store or a special sample pack of coffee, tea and hot cocoa…. SO fun! 🙂 Click here to enter. Hi there. I just downloaded the snowman worktags. I noticed a typo on page 4. The #20 snowman only shows the # 2. Thanks for a great product! FYI… The fix has been uploaded and you can re-download it now to get the proper file! 🙂 Thank you for catching it and letting me know about it!